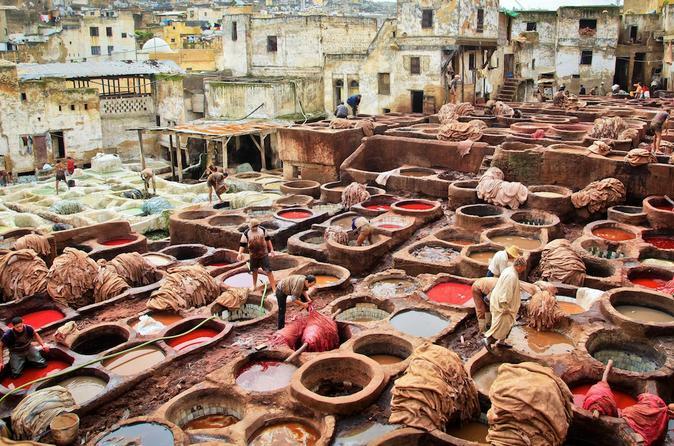 An antediluvian land of imams, scholars, and artisans, Fez is a self-assured city with historical elegance and cultural legacy that enchants every beholder. The city that once acted as the capital of modern Morocco now plays the role of the capital to the administrative region of Fès-Meknès. With the population of about 70,000 people, the city has some beguiling raw charm of dilapidated, dense and dark of Medina. It is classified as the world’s largest car-free urban area with donkey carts moving around plying goods just like the medieval ages. The government has been trying to preserve the former glory of the Fès el-Bali in the backdrop of modern developments. Fès el-Bali is one of the two old medina quarters of the city. The following guide is the ultimate one that takes one to the virtual tour of the awe-inspiring blue city. Visiting Fez el Bali is one the top things to do in Fez. The historic cradle of the city Fez and the center of the Moroccan administration till the year 1912, Fez Medina or Fez el-Beli is the principal tourist attraction of the city. With all its maze of traditional souks, dense alley leading to numerous mosques, palace, and Madrasas, Fez el-Bali creates a perfect portrait of beauty and elegance. The old Medina is a protected site of UNESCO world heritage, that is surrounded by city walls and series of monumental gates dating back to the 13th-century. The charming blue tile work of Bab Boujeloud of the 20th century is the notable feature of Fez Medina. Located in the center of Medina close to the souk of carpenters, the Nejjarine Square is one of the major Fez attractions. The square is known for the magnificent Nejjarine water fountain, and is a perfect blend of ornate skill and jeweled perception. The fountains of the Nejjarine Square located just in the front of Mosques are primarily meant for drinking. The Fondouk el-Nejjarine is an impressively designed and preserved travelers’ inn dating back to the 18th century, is now home to carpentry museum. Decked with intricately carved woodenbalconies and chiseled pillars, the museum is a sight of awe for the visitors. One can witness the artistry works and carpentry tools dating back to the early 14th century at the museum. Standing gloriously in the 80 hectares of land with dazzling facade, tiled and carved arched doorways the Fez’s Royal Palace is an emblem of charm and splendor. The magical obscurity of the mansion with all its giant, bronze doors speaks a ton about the opulent life of the Moroccan royals. The palace is still resided by royalties during their stay at Morocco. The beautiful and exquisite gardens encircling the palace and the illuminated exteriors at the night make it a must visit tourist site at Fez. Standing majestically at the entrance of the Fez’s perfume and spice market, the gorgeous structure of Al-Attarine Madrasa is a perfect picture of grandeur against the backdrop of stalls and cobblestones of the souks. Built in the 14th century by Marinid Sultan Uthman II Abu Said, the madrasa was an important destination of spirituality and learning. With ornate pillars, carved stuccos, hand glazed tiles; the madrasa is the true symbol of exquisite Islamic architecture. Built by the French in the year 1913 during their occupation, Bab Boujloud serves as the channel to the bustling Fez Medina. The Persian blue and green tile mosaic decorating the horseshoe arches of the gate gives it a sight of magnificence. The sight of two minarets stands in the backdrop of the archway, one of them belongs to the Sidi Lazzaz Mosque and the other is the part of Bou Inania Medersa. The area surrounding the grand gateway is pulsates with life throughout the day and is the best place to observe local culture of Morocco. One of the most notable museums of Fez, Dar Batha Museum houses a vibrant collection of arts and crafts belonging to Morocco. It offers an insight into various Fez's points of interest. The collection of the museum includes things ranging from antique Berber carpets, hand-painted ceramics, leatherwork, woodwork to embroidery, gold plated astrolabes dating back to the 14th century. As the museum is located in the Hispano-Moorish palace of the 19th century, the surrounding of the museum also offer an impressive sight. Established in the 857 AD, the mosque is the second largest and the oldest Islamic structure of Morocco. It is the most visited and admired monuments of Morrocan Empire. Considered as the holiest mosque of Morocco, the structure also houses a University of thesame name and acts as the most important spiritual center for Muslims. The Islamic structure is not open to Non-Muslims and has the capacity of roofing about 20,000 devotees! The place which was once a former traders’ inn, now acts as home to the Nejjarine Museum of Wood Arts and Crafts. The museum enables every visitor to get an insight into the ancient prayer beads, craftsmen’s tools, musical instruments amongst others. The structure of the museum is a treat to eyes with all its intricately designed courtyards, carved wooden archways, cedar ceilings etc. The museum is located in the magnificent Nejjarine Square, the avenue you will be visiting the most when in Fez. The last resting place of the Moroccan ruler and city’s founder Moulay Idriss II, the Zaouia de Moulay Idriss II was restored in the 14th century and is the holiest shrine of the city. The shrine is believed to bring luck and fertility to the pilgrims visiting it. Non-Muslims are not permitted into the shrine; it is the sight of exquisite plaster work, ornate tiles, and carved arches. Surrounded by the candles and lamps the shrine is the place to soak in some Moroccan spirituality. Fez' medina is a chaotic place almost edging on mayhem, but it is these imperfections that make some of the visitors instantly fall in love with the intensity of the city while others find it a conundrum of horror. The blind alleys to the squares lead people to mouth watering aromas of food stands and breathtaking fountains surrounded by busy streets, workshops of skillful artisans and rooftops overlooking the minarets. One may enjoy the delicacies of Moroccan cuisine in one of the Best restaurants in Fez that are housed here. So pack your bags and see for yourself the innate beauty of the city. While you may come back, but a part of you choose to stay back! By Air: Fez has an international airport but serves limited flights. A better way is to take a flight to Casablanca (183 miles), Agadir (469 miles) or Tangier (248 miles). Rest of the journey into Fez can be done by regular train or bus. By Road: Daily buses ply to Fes from Casablanca, Marrakesh, Tangier, Meknes, Oudja, and Tetouan. One can also hire a taxi which is a little costly but if you are looking for comfort, they are probably the best. By Train: There are regular trains to Fez from Casablanca, Tangiers and Marrakesh. Here are the tours that we have handpicked just for you for your visit to Fez.